Humans are an inherently skeptical bunch. Our fight or flight instincts are constantly scanning our surroundings for signals. Is this place safe? Is this person going to hurt me? Will this company screw me over? We ask ourselves these subconscious questions all day, every day. And we answer with gut reactions, bad vibes, or, in the best case scenario, with a sense of trust. This carries over to our interactions with new products and services. Between the moment we learn about a brand and the moment we make a purchase, our brain processes a thousand tiny signals (OK, that’s just a guess) to determine if we can trust the company. As a brand, one of the most important investments you can make is to spend time and energy building this foundation of trust with your consumers. When consumers trust your company, they are more likely to make a purchase and eventually become loyal brand advocates. Research shows us that brand trust is directly linked to positive purchase behavior. Shouting “you can trust us” from the rooftops, however, is probably not going to convince your customer. Individuals trust peer-to-peer communication over brand-to-peer communication, so your best shot at building trust is to encourage electronic word of mouth (eWOM) through user-generated content (UGC). Individuals trust the images of other consumers on social media 7x more than they trust advertising. This makes UGC on social media at least 7x more valuable than advertising.¹ And yet, you are likely spending more time and energy on advertising than you are on soliciting UGC. When you create a UGC engine, you are also feeding a cycle of continuous content creation. This means you can spend less time and money creating your own original content… Or you can funnel this extra time and money into creating even better original content. By paying attention to what and how your audience is sharing about your brand, you can also pick up some new ideas and inspiration. The Campaign: LaCroix runs a campaign on their Instagram page every Halloween that encourages their audience to share their LaCroix-related costumes using the hashtag #LaCroixHalloween. The social media team responds to every piece of UGC and requests permission to share on their page. Throughout the year (yes, way beyond Halloween), LaCroix shares their UGC to their loyal fans. Why It Works: You might be thinking, “LaCroix has it easy! Everyone already loves LaCroix!” And, you’re right. LaCroix taps into the already-existent brand hysteria they’ve created… And they encourage their fans to embrace their bizarre obsession with a sparkling water company (clearly, I’m one of these people). 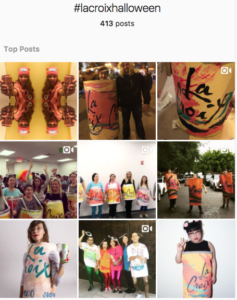 LaCroix primarily shares UGC on their social media platforms and they are constantly holding UGC contests… Their consistent solicitation and use of UGC builds an authentic and engaging social media presence. 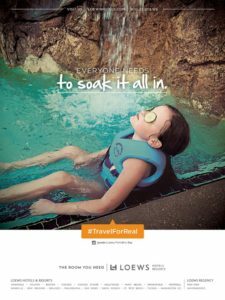 Why It Works: Just browse the images under the #TravelForReal hashtag on Instagram and the success of the campaign is clear. Unlike most hotel promotions, these images show a first person perspective of what it really feels like to stay in a Loews Hotel. Chances are you can relate directly to one of the images, whether it’s a kid playing in the pool, a dog jumping on the bed, or the unveiling of a delicious room service meal. You’ve been there and, better yet, you can imagine yourself there. 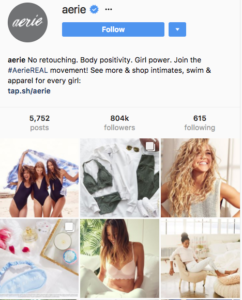 Why It Works: Aerie is speaking to one of the most personal and deep-rooted pain points of their target audience: the struggle to maintain a healthy self-image. Donating money to NEDA (the National Eating Disorder Association) further reinforces the fact that Aerie is promoting a healthy body image and empowering women to show up as they are, free of judgement, in an industry known for unrealistic Photoshopping. Do you spot the pattern? Each brand uses a campaign-specific hashtag PLUS language that empowers their audience to shape what’s being said about the brand. UGC campaigns are transparent, authentic, and engaging – the digital marketing trifecta. Brands can wait for consumers to organically supply UGC, or they can take action to encourage their audience to share brand-related original content. Running a UGC contest on Instagram is a smart strategy for brands looking to build brand trust and influence purchase behavior. In order to design and execute a successful UGC contest on Instagram, a brand needs to understand what motivates the consumer to share on Instagram, how to drive engagement on the platform, how peer to peer communication influences purchase behavior, and what to do with the content once they have it. Research shows that consumer motivations for using social media are divided into five categories: social interaction, archiving one’s life, self-expression, escapism, and “peeking” at content. You will need to do your own informal or formal netnographic research to determine the primary motivators for your target audience. You can also ask your audience with a quick survey… We highly recommend conducting monthly audience research to keep your finger on the pulse of your customer. Once you nail down your angle, UGC should be part of your ongoing digital marketing strategy. If you feed the UGC engine, you will always have fresh, trustworthy, and relevant content to share. You can read my blog post on creating a successful social media contest here. UGC carries certain copyright risks with it. In order to protect your business and honor the rights of your audience, it’s vital that you receive explicit permission to share content before adding it to your social queue. Using UGC for brand-related and commercial purposes is an especially delicate area. If you are potentially profiting off of UGC by using it as a form of advertising (an even more effective form, as we learned above), you need to be transparent. Handing the mic over to your customers is scary. Yes, we can admit that! Letting go of control is difficult for business executives, entrepreneurs, and marketers alike. But, the benefits far outweigh the risks. Just make sure you have someone (or a team!) assigned to monitoring the conversation… If a negative review pops up, address it head on in a positive manner. Stay tuned for a blog post coming soon on how to effectively manage your reputation, handling internet trolls included. Now, go forth and build brand trust!